When we wrote our article about the first generation dual-core chipsets way back last summer, they were all still sampling with manufacturers, but now that three of them have gone into devices, we have the chance to observe how they actually fare. At the time the Texas Instruments OMAP4 4430 chipset seemed the most promising to us, because of its added functionalities for image processing, and optimized battery consumption. We won't mention the dual-core Snapdragon here, as we are yet to handle it in a phone. OMAP4 seemed to offer more than NVIDIA Tegra 2, while not much was known about Samsung's Exynos chipset, which, until recently, was called Orion. We only know that Samsung switched from the PowerVR graphics chipset line, which was present in its Hummingbird chipset in the Galaxy S, and in the iPhones, to ARM's own quad-core Mali GPU. Little was known exactly how many triangles per second is Mali supposed to push out. Samsung claimed it will give 5x the performance of its previous GPU used, which would have put it at insane speeds. On ARM's website the same 5x claim is made, but in comparison to the old Mali GPU, so go figure. Of course, performance depends on many variables - at what level are the GPU and memory clocked, the driver's version, software, etc. The Power VR SGX540 in the TI OMAP4 chipset, as found in the LG Optimus 3D, is clocked around 300MHz, 50% higher than the same GPU in the Galaxy S. NVIDIA uses its own eight-core GeForce GPU in Tegra 2, which performs slightly above the Hummingbird GPU, clocked as it is in the Galaxy S.
Enough with the theory, let's see how the LG Optimus 3D with Texas Instruments OMAP4 4430, the Motorola ATRIX 4G and LG Optimus 2X with NVIDIA Tegra 2, and the Samsung Galaxy S II with Exynos performed in reality. Anandtech has managed to run a couple of quick tests for graphics and browser performance, and the results confirm what our own tests showed the other day. 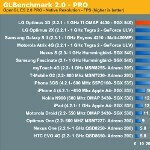 Our Quadrant benchmarks from the other day placed LG's finest at the top in general benchmarks too, but we thought it is due to the file system the Samsung Galaxy S II might be using, which slows its read/write performance down. 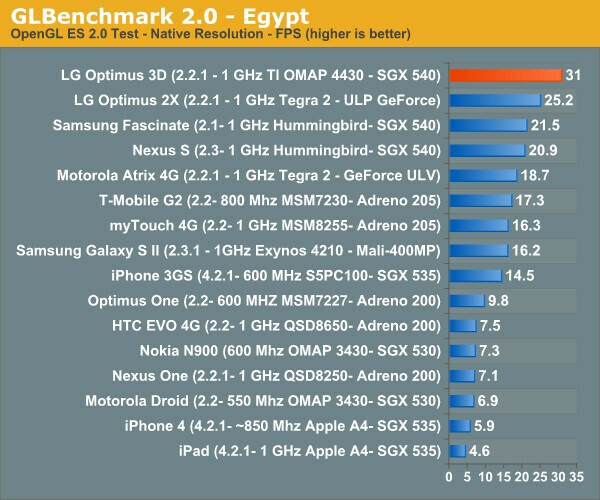 The graphics results, though, are rather revealing, despite that we sincerely doubt these tests have been optimised for two CPU cores, let alone multicore GPUs - Tegra 2 has eight-core GPU, and Exynos has quad-core, for example. Anyway, these benchmarks are just for bragging rights - any of these handsets has more power than you will ever need in your phone for running the everyday apps, and it will be so for a while. 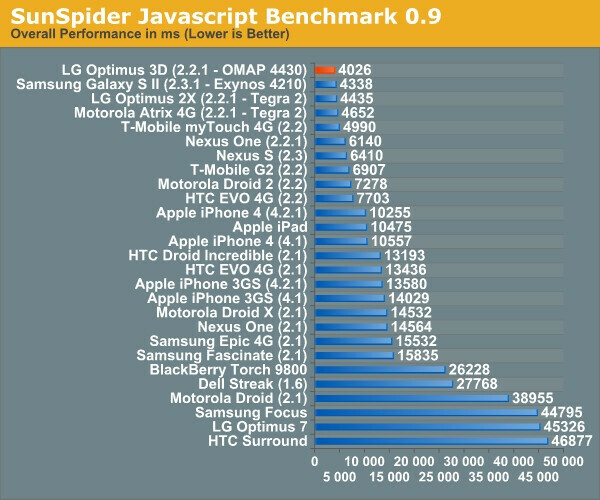 Besides, although Tegra 2 beat Exynos in the graphic test, it still does Full HD 1080p video at only 24fps, whereas the Galaxy S II does it with 30fps, so synthetic benchmarks are just for kicks. Also, the Optimus 3D and Galaxy S II are non-final units, so take these with a grain of salt. The Motorola ATRIX 4G's software is probably not finalized too, otherwise the company wouldn't have warned that Full HD 1080p recording will come post-launch via a firmware update. 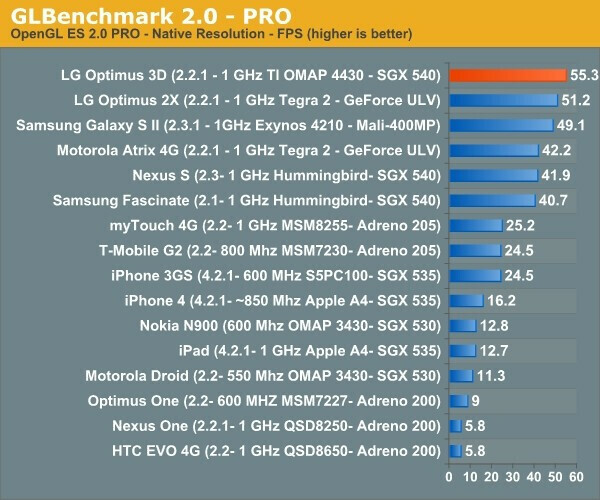 Everyone was thinking about Tegra 2 and Orion/Exynos - what will be better. And now we have unexpected winner - TI OMAP 4430. None of these tests have been optimized for the new phones. Once the tests catch up to the hardware the results can change drastically, not to mention when the OS bugs are finally worked out. In any case, they are so close in score I would take the S2 over the Optimus 3D just for two things alone, the S2 is much thinner, and it can do 1080P at 30fps. I don't need the 3D gimmicks. Design and sleekness is one aspect but for me and most gadget geeks performance has to be put into more consideration. Nothing like benchmarking new phones to make my Moto Droid look outdated. Amazing what can happen in 18 months. This just makes my update choices more confusing. Have to wait till I can get my hands on some of these before making a final decision on upgrading. Not as single SE phone on there. Wave of the future I know, but as far as new phone purchases go- how long before this type of processing speed is actually needed for the more basic user? Is it truly a worthwhile for the premium price, say in the next 12 months? Most of what I have read is dual core may be 2 years ahead of the need- is this accurate? 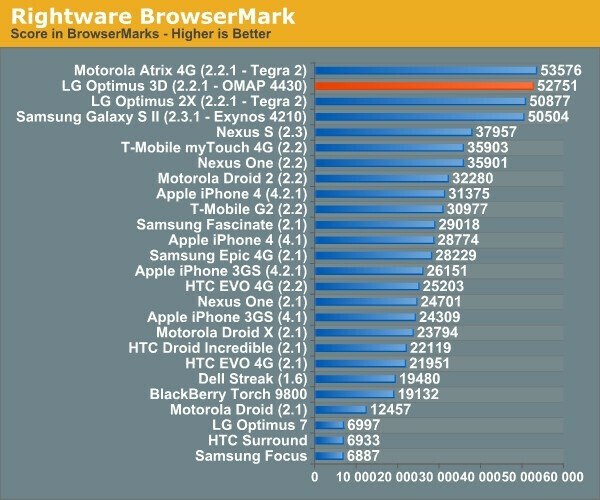 Who would've known that the myTouch could beat out so many 'better' devices with faster processors?! Would have been nice to see the Vibrant (the only American GalaxyS variant with 2.2 froyo) in the lineup. I object to showing a N900 at a measly 600mHz... Mine is clocked at 1150mHz! 1080P is 24fps, 1080I is 30fps. probably should know what you are talking about before you type. 1080p is a resolution, not a screen refresh rate. a standard lcd tv has a 60hz refresh at 1080p, what would you call that then if p is only 24 fps? some new tvs refresh at 480hz now. 1080p and 1080i are only different in the way the image is processed and displayed on your tv. like a panaramic vs 2 side by side photos. This is done only because a phone or small camera dont have enough image processing power to store the data fast enough.That is the only difference in the 2. maybe you should read your own words Jeffplusplus, and do as instructed.